If your future includes a move to Cabazon, check out Meathead Movers! Our professionally trained student-athlete movers, moving concierge, and princess packers are prepared to get you safely moved into your new Cabazon home. 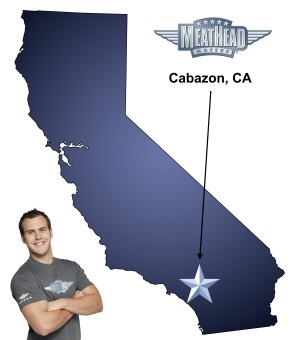 When you make your move to Cabazon, be sure to contact Meathead Movers. No matter what type of moving service you need, our student-athlete movers are ready to handle all your moving needs. Cabazon might look small, but it has a lot to offer anyone who’s moving to the area. If you’re moving to Cabazon, let Meathead Movers help you out. We have an experienced Cabazon movers team who are ready to pack, move and unpack your belongings in a flash. Famous for its dinosaur attraction, this city lies to the east of Beaumont and Banning and sits between the San Bernardino National Forest and the Santa Rosa-San Jacinto Mountains. Cabazon takes up less than 5 square miles of land area in Riverside County and has just over 2,500 residents. For outdoor enthusiasts, Cabazon offers the Desert Hot Springs to the east, the Lake Perris State Recreation Area to the west, Big Bear Lake to the north, and Mt. San Jacinto to the south. If you want to spend a day in the city, it only takes 40 minutes to drive into San Bernadino. Cabazon offers its share of attractions, such as the Morongo Casino Resort and Spa and the World’s Biggest Dinosaur Gift Store. If you enjoy shopping, you don’t have to head into Redlands or San Bernardino for its shopping malls; stay in Cabazon for the Desert Hills Premium Outlets and the Cabazon Outlets. From clothing to food, these outlet malls offer everything you need. After shopping, take the family to see the giant dinosaur sculptures alongside Interstate 10. If you prefer a quiet night at home, stop by the Cabazon Library and pick up a book for the evening. From roadside attractions and shopping centers to Native American casinos, Cabazon offers big fun in a small town. Our moving team consists of drug-free, smoke-free student-athletes who jog when they’re not carrying your belongings and can move you in and have you settled in no time. Whether it be a local, long-distance, or commercial move, we are prepared to ensure a fast and efficient move. We offer fixed pricing on long-distance moving, provide incentive programs for everyone and stay active in our communities. We also have our Princess Packers who can pack and unpack your items so that you don’t have to. If you need help finding local service providers, our distinctive moving concierge service can connect you with the help you need. For a faster way to move, check out our team of Cabazon movers. With our 100% satisfaction guarantee, the only thing you have to lose is the stress that comes from moving! So contact us today for a free no-obligation moving quote and to learn how we can help you on your next move!